During the Klondike Gold Rush of the late 1800s, and for many years before and after, the quickest way to get from Whitehorse to Dawson City was via the Yukon River. In those days life in the territory was governed by whether the river was open or frozen. During the summer months numerous boats of all sizes plied the route, but once winter set in and the river froze only experienced mushers and dog teams braved the journey. Because of this during the freeze up in early winter and again during the spring break up travel was extremely limited, and once winter set in transportation was available however it was slow, costly, and bitterly cold. During the winter of 1899-1900 the Canadian Development Company used dog teams to carry mail and light freight along the river between Whitehorse and Dawson City. It gradually replaced dogs with horses the following year. In 1901 the White Pass & Yukon Route Railway bought out the company in order to gain the lucrative government mail contract for its stern wheeler boats. In 1902 the Yukon government contracted the White Pass & Yukon Route to build the first winter road between the two communities. Construction began that summer and the road was completed in November. It was 330 miles long – shorter than the river route by about 70 miles – and was built at a cost of $129,000 (equivalent to over $3,000,000 in 2017 dollars). 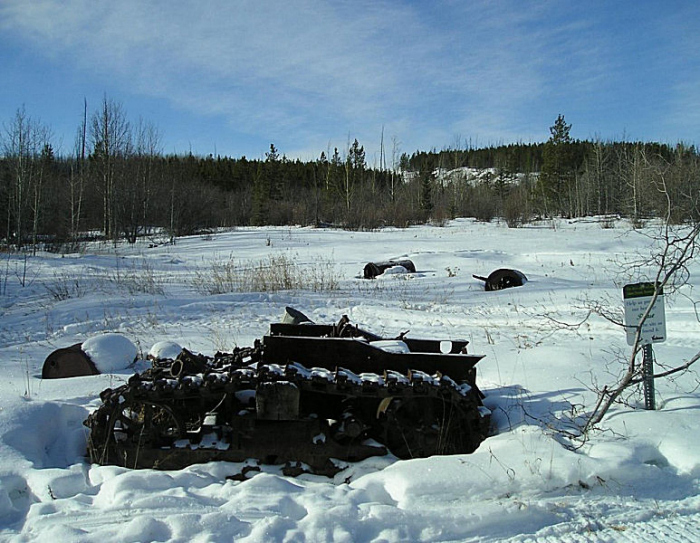 This winter road between Whitehorse and Dawson City became known as The Dawson Overland Trail, and it marked the beginning of a new era of transportation in the Territory. For Dawson residents, it created a much-needed winter link to civilization. For the first time ever they were not cut off from the rest of the world for up to eight months of the year. 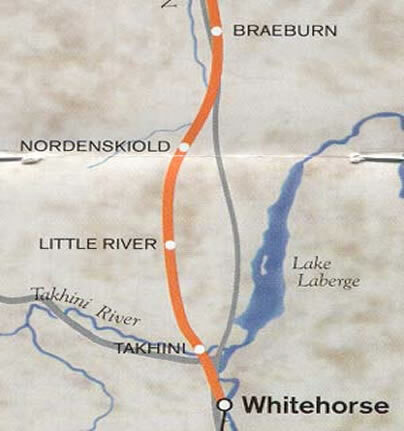 During the 1950s Whitehorse and Dawson City were connected via highway (First built as an extension of the Mayo Road, and today known as the North Klondike Highway), which effectively replaced the slow and rough Dawson Overland Trail. However, to this day most of the original route of the Dawson Overland Trail remains, and offers hardy travellers a challenging path back in time. Many artifacts and a few buildings remain along the trail as evidence of its history. The Takhini River to Braeburn section is open for adventure! This section of the Trans Canada Trail is about 100 km long; starting at the staging area on the Takhini River Road, (near Takhini Hot Springs) and ending at Braeburn Lodge. Though the trail is generally marked and somewhat maintained, it is still very much a remote wilderness trail with very little traffic, no services, and no cell phone service – a true class 5 trail. Also please note in recent years several beavers have made the area their home, so there are multiple sections of the trail which are often muddy and flooded, making summer travel difficult. Trail users must bring suitable supplies and equipment with them and always travel with someone who knows the trail well. 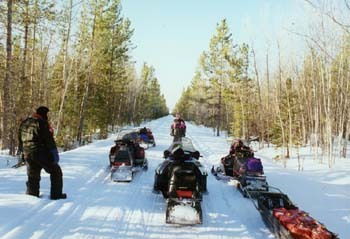 Regular users of this trail include snowmobilers, mushers and skiers in winter and hikers, mountain bikers, horse riders and ATVers in summer. Along the trail from Takhini to Braeburn travelers will be passing in the vicinity of several active trap lines, hunting areas, and a variety of First Nations lands. There are Yukoners who depend on these areas as one of their main food sources, so please travel respectfully and stay on the trail as much as possible. At approximately the half way point on this section the K.S.A. has constructed a small warm up cabin. It offers a shelter with wood stove and bunk bed, and outside is a fire pit and picnic table. Anyone is welcome to use it as a place to stop, warm up and cook some lunch. However, please respect it by taking your garbage with you and leaving the cabin in good clean shape when you’re done. It was built entirely by volunteers using donated materials, and is unmaintained. How you leave it is how the next group will find it.